What do you get when you cross a bunch of horses with men in tights? Why, a knight of entertainment and chivalry of Medieval proportions! At the behest of the Royal Court, the kids and I were summoned to the Toronto castle as guests of King Don Carlos. 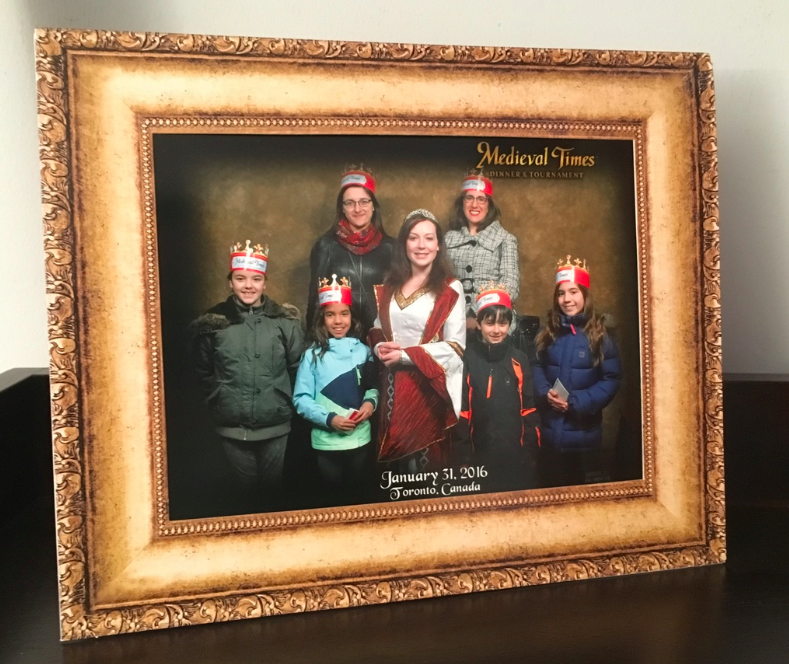 This was our third visit to the castle but this time we were fortunate enough to bring friends along with us, none of which have ever had the pleasure of visiting Medieval Times in Toronto. 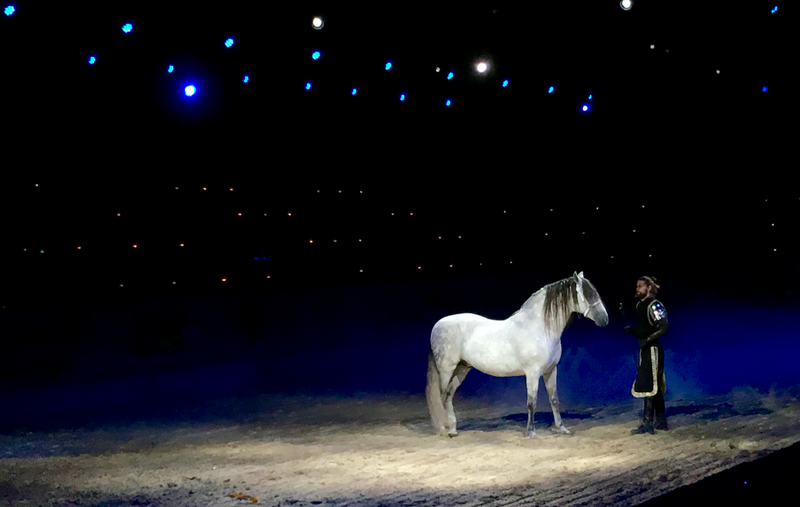 Not only did our trip to Medieval Times allow us to experience epic battles of steel and steed, we enjoyed displays of equine beauty and grace. 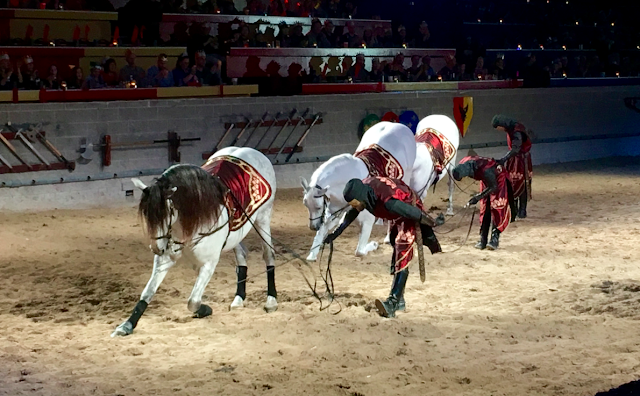 The choreographed performances of the magnificent Andalusian horses are, in and of themselves, a spectacle to behold. The kids also enjoyed watching the royal falcon take flight as it was set free to circulate throughout the arena while onlookers marvelled from below. Throughout these performances, guests are served delicious garlic bread, tomato bisque soup, roasted chicken, sweet buttered corn, herb-basted potatoes, the pastry of the Castle, coffee and two rounds of select beverages. The challenge of eating without utensils made it all the more fun for the kids. Our friends thoroughly enjoyed cheering on our noble knight who battled his way towards King's Champion. My daughter was also the recipient of a flower given to her by our victorious knight. As part of our VIP experience, we were delighted to have been granted an upgrade - the King's Royalty Package. Not only did we enjoy preferred seating in the first row, we also received cheering banners, commemorative programs and a group photo for each member of our party. A lovely souvenir! *Please note: you may not be combine this with any other discount, special offer or group rate. Not valid for special shows, holidays or prior purchases. Restrictions may apply. Upgrade packages, tax, gratuity and applicable fees are additional. Valid only at the Toronto Castle thru 3/31/2016. If you have yet to experience Medieval Times or you just can't wait to return, I have a pair of tickets to the Toronto location to give away. Simply complete the Rafflecopter form below. Prizing includes two general admission tickets only and does not include transportation. Disclosure: We received complimentary admission to facilitate this review. Any opinions expressed in this post are my own. I would like to win as hubby and I have always wanted to go there. It would be a great idea for a date night! I would like to win to take the teens in our family - there's so little out there to do with them as a family....beyond Disney and too young for concerts etc. 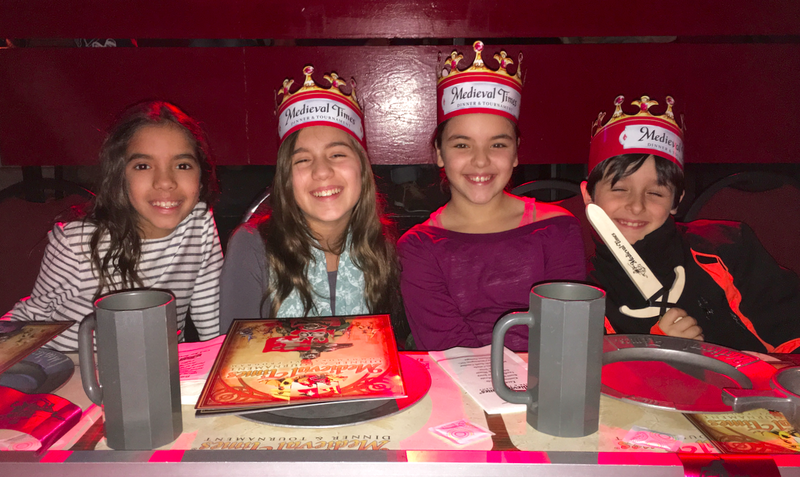 The beauty of Medieval Times is that it's great for kids of all ages. Even adults! They would love it. Especially if they have never been there before. I would love to win these and gift them to a good friend that hasn't had a chance to go with her boyfriend. That is so nice of you, Nancy! I would actually LOVE to pay it forward and win these tickets for my friend/manager so she could take her husband and two boys. They have really wanted to go! What a kind gesture that would be! I would love to take my son to this show. It would be a fun outing. It sure would! The battle scenes are really neat. When swords connect, you actually see sparks fly! I'm sure they would. It's definitely something you have to try at least once. My two girls would love to experience this! They could even wear princess costumes. I've seen a lot of girls use wear their Halloween costumes. I would like to win because my daughter went and had a lot of fun. I want to see it. It would be a great night out! I would love to take my kids to this live show. I want to go because my kids LOVE dressing up as a Knight and Princess. I think it would blow their mind to know Toronto has their very own castle with real Knights and Princesses. Eating with their fingers would be another highlight I’m sure. All in all I think it would be a wonderful experience for them. 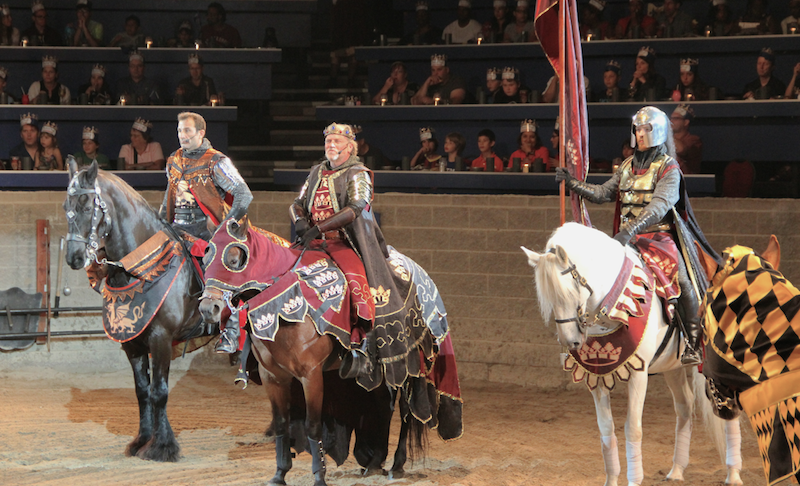 I would love to win these tickets as my Kids are huge Medieval Times fans. We have taken them a few things and each time it truly is a unique experience. They just love it. You get lost in the show, the food is excellent and it's just a wonderful family experience. My kids have been working really hard in school this year and I would just love to take them as a reward for all their hard work. I would love to win so I could go on my Birthday this month. I would love to take my boyfriend on a date here. He loves Medieval Times stuff and we both have never been! Would LOVE to take my boys here! I, nor they, have ever been! This would be a great family night out. Expensive to take a family of four but, if we could get the tickets that saves us a lot. Really want to go. We are going to ON the summer and would love to experience this! Thanks! I would love to have a night out with my kids. We went to their show in Orlando in April and The Kids are still talking about it. Would love to see their Toronto show! I would love to win to introduce this fun show to a friend. I'd love to take my wife and kids! I'd take my neighbour. He appreciates Medieval Dining. He's always over for BBQ. My daughter has been dying to go. I would take her. This is such a great family outing. We took my son and our parents. I would love to bring my boys to Medieval Times. I think they would love it. went last year with two of the grandkids, loved it!